When a busy couple with one child wanted to relocate to Colorado, they purchased a modest Boulder townhome with lots of potential. They enlisted Beautiful Habitat to help them turn the dated space into the family home of their dreams. In stages, the cramped, dated 1970s townhome took on a whole new look and feel. Today, the couple enjoys their forever home at the base of the Flatirons. One of the first challenges was figuring out how to help the family downsize into this 1100-square-foot home and have the right amount of storage and functional space. This started in the kitchen. Efficient use of space and upper cabinets that reach the ceiling maximize storage, while creating zones — such as a beverage zone — improves functionality. The peninsula provides ample space for eating as well as doing homework. And the family can comfortably entertain here. The kitchen design is award winning; check out our previous post on that and see what it looked like before the makeover. The dining area incorporates a built-in bench to maximize seating. Floor-to-ceiling storage cabinets are perfect for storing over-sized kitchen items that don’t get used every day. And they beautifully camouflage a workspace with a pullout desk. An open staircase was closed in to provide even more storage while creating nice boundaries for the dining area without compromising the overall open and airy feel. Thoughtful interior design uses every nook and cranny to its best potential. Because the Boulder home looks out on the Flatirons, the couple decided to forgo the dated fireplace and instead add a large window to the living room to capture the views. The interior design is minimalist with simple, modern trim and white paint that makes the room bright and cheery while allowing the accents to be the focal points in the room. Another feat of functionality comes in the guest bedroom. A custom wall unit includes storage and a fold-down desk. But the pièce de résistance is that the unit is also home to a Murphy bed. And because everything folds up and out of the way, the room doubles as a yoga studio. The first-floor bathroom is a luxurious space with a floor-to-ceiling marble shower, marble floors and a marble top on the rich, dark wood vanity. The traditional features complement the modern, fresh touches such as the large-format, graphic wallpaper and glass shower surround. Upstairs a Jack-and-Jill bath was converted into master bath and also a full bath for the couple’s daughter. The master bath design carefully blends sleek, white cabinetry, marble tile and countertops with rich, dark colors in the shower. 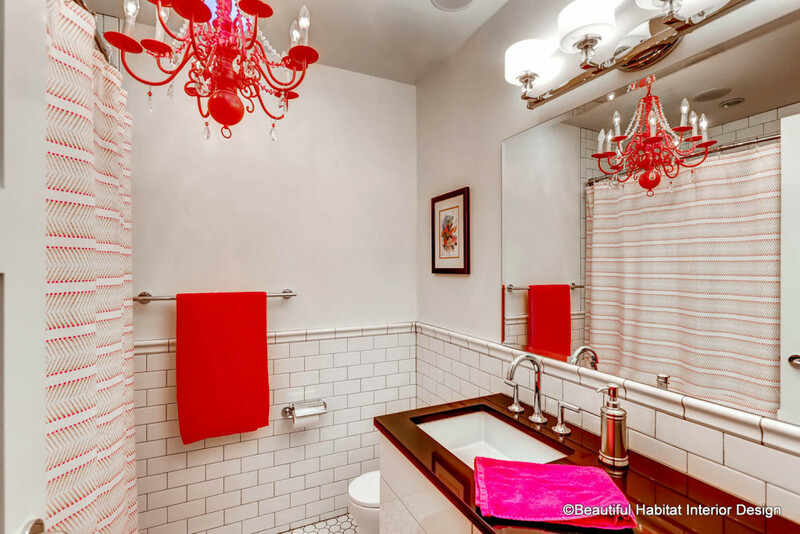 Luxury touches such as a chandelier and a high-gloss countertop make this kid’s bath a lovely space. Contact Beautiful Habitat today to turn your so-so space into the forever home of your dreams.